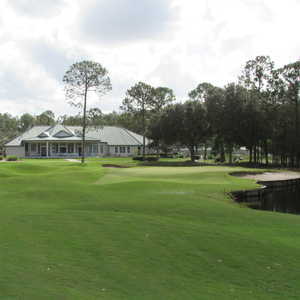 JACKSONVILLE, Fla. -- Bring lots of golf balls with you to Cimarrone Golf Club. Many of them will go swimming. They also will bounce and bound around on the many swales and mounds in the fairways and skitter across some quick greens. There's water on 17 of 18 holes at Cimarrone Golf Club in Jacksonville. That's what your golf balls are in for on this golf course. What you're in for is a golf course that loves water -- lots and lots of water. There's water on 17 of 18 holes, said Patrick Ashe, head professional and general manager at Cimarrone Golf Club. The water lies in wait in marshes between tee and fairway, to the left or right en route to the hole, or between the fairway and the green. And once you find terra firma on the greens, your work isn't done. The all-season putting surfaces, seeded with paspalum, are lightning fast in the winter, when the turf goes dormant, and still speedy in the summer when they're growing, Ashe said. "We offer good service and we have a good layout," Ashe said. "The layout brings people back. You won't have the same iron shot to every green." That's certainly the case, with par 4s from the middle tees ranging from 302 to 387 yards and the par 3s from 134 to 171 yards. Cimarrone Golf Club also offers five tee boxes from 6,891 yards down to 4,704. But the golf course's challenge is keeping the ball in the middle of the fairway, then depositing it directly on the green and keeping it there. Making those objectives difficult are marsh or water carries on the tees, wild mounding and undulations on fairways and frequently interrupted fairways, usually from 100 yards on in. And in those stretches are riotous mounds that make any shot jump unpredictably and leave you with an uneven lie and an uneven stance. Then, there's the bermuda rough, which is long, dense and downright grabby at this time of year. A word to the wise is to study each hole's layout on the granite markers at each tee. You'll see where water pushes toward the fairway or those darned mounds will claim the fairway in front of the green -- again. The staff gives you a chance to dial in your approach by breaking the greens into nine pin positions. The golf course gives you blind shots to a few greens and a lot of bunkers around the greens. There are two givens at Cimarrone Golf Club, unless you're having a perfect round: You'll wind up in the sand and in the water. 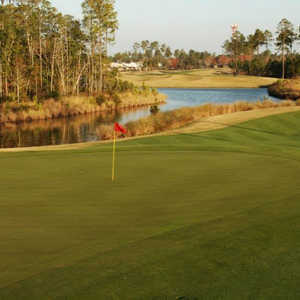 The golf course has a great tempo, from crazy tough holes to cruisers that give you a chance, however brief, to relax. It's a tough golf course to play sight unseen, because there are surprises, but you can imagine how much your score can improve next time. 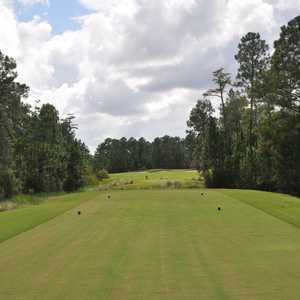 The first hole is a par 5 with marsh at the tee and water along the right, with mounds bisecting the fairway at the green. It's important information that golfers don't attain until they see the options, but then it's a little late. You'll also discover after the fact that one should aim your drive on No. 10 over the mound on the right. There's a landing area below it, but you can't see it from the tee. From there, you have an easy approach over water to the green, one with a massive bunker stretched behind it. You also will learn to ignore the frequent mounds that erupt in front of the greens and around them and gain the confidence to fly your ball to the green. Adding to the golf course's unique design, the staff adds details that make the course more remarkable, from the precise pin locations to an array of landscaping displays throughout. The clubhouse is regal, with a huge porch overlooking the golf course, including No. 18, one of the best closing holes out there. The par 5s are memorable, from the first hole with its two routes to regulation, to the terrific approach on No. 5. It's a serpentine hole, where shot planning and placement is critical. If you drift right, you'll have to thread a shot to the green that isn't too short, isn't too long, not too far right, not so left. It's an offset, elevated green guarded in front and right by water, left by sand. On the back, the par 5s are right next to each other. No. 13 is a short par 5 reachable in two, followed by a serpentine 14th hole that snakes around a marsh, requiring a sound plan and perfect execution. Then there is No. 18. It's a great par 4 with elevated tees down to a landing area from which you have to land on the green. Short, you're in a mound field. Right, you're wet. Left, you're sandy. It's a great hole that acts like a siren call. Think of just that hole alone and you'll be drawn to this golf course again. Michael Dinapoli, from Jacksonville, likes Cimarrone Golf Club's challenges. "Water is in play on 17 holes," he said. "If you hit your shots, you'll be fine, but if you don't, it's punishing." Ronnie Allen, a 10-handicap player, was returning to the golf course after a hiatus. "I like the way it's designed," he said. "It's fair, and I like the multitude of tees." And then there are the mounds. "You'll have a side hill, uphill and downhill lies." But overall, he said the course is pretty forgiving. "The water doesn't come into play that much if you play well. "It's not a snooty place. They care about the people who come here." In short, Cimarrone Golf Club is a tease. It punishes you frequently, but after playing 18 holes, you won't rest until you play that golf course again, more confident and proud of your accomplishments. Allen also offered an interesting observation -- that it's a good place to learn golf. "You're going to get everything, and sand does come into play," he said, that is, you'll have to learn how to get out of it. And humility. The course will teach you that, too.